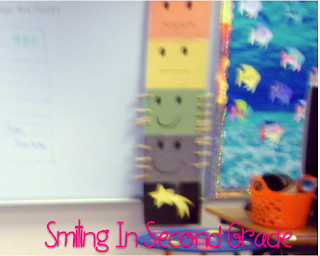 Smiling in Second Grade: Behavior Linky Party! I'm linking up with What the Teacher Wants! 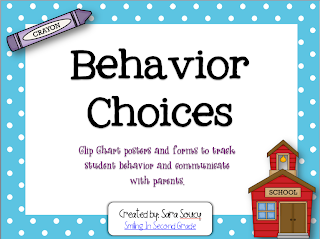 to share how I manage behavior in my classroom. Each student has a clothespin with their class number on it. All the students begin their day on the color green. If a student shows positive behavior, they move their clip down to blue. If they show more positive behavior, they move it down to the superstar. The same goes for the other direction. If a student is showing behavior that is not so positive, they move their clip to yellow, then orange, then red if the behavior continues. The students only move their clips one block at a time. For example, if they are on green and do something good, I'll say "move your clip down" and they move it to blue. However, if they then show a negative behavior, I will say move your clip up and their clip only goes to green. The clips move a lot during the day, which show the students that their behavior is important all day long. 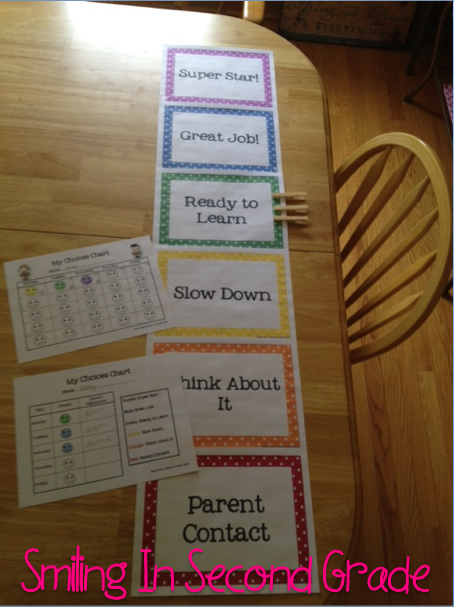 At the end of the day, the students fill out their behavior charts. They have a weekly or monthly calendar with smiley faces. 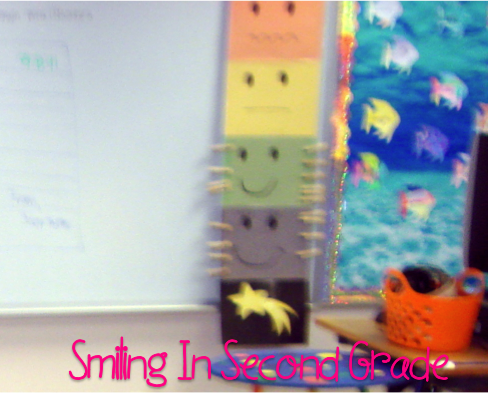 Each student must color in their smiley face for the day that corresponds to where their clip is at the end of the day. As you can tell from the picture, I use a lot of positive reinforcement in my class. It is a rare day when a student moves past yellow. If I see a child behaving incorrectly, I will praise the students around him/her for doing the correct thing. It usually gets their attention! At the end of the year this year, I decided to toss my clip chart. It was falling apart and completely faded. I wanted to stick with the same concept though. The only thing I wanted to change was to move their clip up for positive behavior and down for negative behavior instead of vice versa. I also wanted to add some word reminders on the posters. Yes, on my kitchen table. I don't go into school much during the summer. And, yes, it's polka dots! Additionally, I use a whole class system as well. The students start the week off with 20 minutes towards Fun Friday. 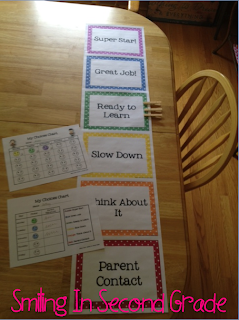 As a class, they can earn or lose minutes depending on their behaviors. If the whole class is quiet in the hall, for example, they earn a minute. Anytime they earn a compliment from another staff member, they earn a minute. However, if they can't quiet down to listen to directions, they might lose a minute. At the end of the week, the students are given free time on Friday. They are allowed to use pattern blocks, computers, puzzles, etc for the amount of time that they earned [if they finished all their work]. Works like a charm! Phew, that was a lot of information. Are you still with me? 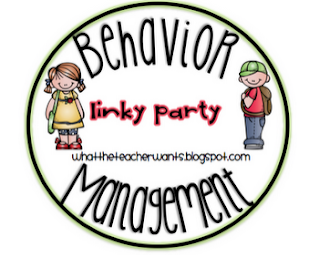 What does behavior management look like in your classroom? Ok, duh!! Weird it didn't log me in! Your clip chart is so cute! Thanks for sharing! CUTE clip chart. How have I missed your blog so far?? I just found it through this linky party....awesome! I'm a new follower! How is your minute box displayed for the class to see their progress for the week? Is it always this tiring? ?